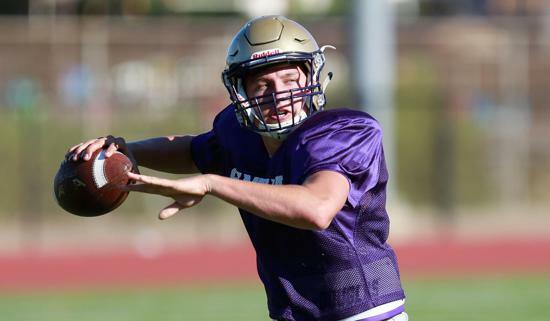 Santana quarterback Josh Oedewaldt will take aim at crosstown rival West Hills. Castle Park had a rough opener, losing 38-6 to Hilltop. Mar Vista opened with a 30-0 win over San Diego. The Mariners were led by QB Mike Wilson and RB Noah Berry. West Hills suffered a 24-21 opening-week loss to El Centro Southwest. Santana fell behind by 24 at the half and lost 43-19 to Bishop’s. Sultans QB Josh Oedewaldt threw for 180 yards. Vista surrendered 409 yards — 357 passing — in a 37-13 opening-week loss to San Marcos. The Panthers completed just two passes and had 19 plays go for zero or negative yards. San Pasqual scored late, then missed on a 2-point PAT try and lost 14-12 to Granite Hills. RB Saud Carrillo led the San Pasqual offense with 96 rushing yards. Steele Canyon started the season with a 23-10 road loss to Torrey Pines. Madison, ranked No. 7 in the San Diego Section, lost 20-9 to Vista Murrieta, a team ranked No. 6 in the state. The game was tied 6-6 at the half. QB Terrell Carter threw for 201 yards and RB Erick Buchanan had 103 rushing yards and 123 receiving for the Warhawks. The top-ranked Saints opened with a 62-13 win over Ramona. QB Rodney Spencer threw for 175 yards and RB Darrell Broussard ran for 109. Isaac Taylor-Stuart had 99 receiving yards and Tariq Thompson 95. Carlsbad, ranked No. 10, blanked Del Norte 28-0 last week. QB Isaiah Ramos threw for 146 yards. No. 9 Mater Dei Catholic opened with a 35-0 win over Valley Center. The Crusaders rolled up 442 yards total offense, including 307 rushing. CJ Verdell ran for 276 yards and five TDs. El Capitan had a bye last week. The injury-riddled Vaqueros were 2-9 last season but had a productive summer. Hoover was beaten 51-0 by Monte Vista in its season opener. Chula Vista beat Mount Miguel 35-30. Spartans QB Frank Escobar had TD tosses of 35 and 67 yards and connected on a key 2-point PAT. Sergio Figueroa scored a pair of TDs. QB Bryan Pace threw for 164 yards and a pair of TDs last week as Henry beat Mira Mesa 25-7. Ryan Savage and Dominick Silvels had TD catches. CB Jacob Williams had 10 tackles. Bishop’s was equally impressive with a 43-19 win over Santana, rolling up 533 yards total offense, 290 passing behind QB Jeffrey Jackson, who had two TD tosses each to Jacob Jackson and Mozes Mooney. El Camino started the season with a 21-8 win over Point Loma. QB Jaden Casey threw for 146 yards while Chris Brown rushed for 155 yards and two TDs and had an interception on defense. Ranch Bernardo, ranked No. 5, blanked Eastlake 38-0. The Broncos had 383 yards total offense — 227 passing from QB Mark Salazar. Bonita Vista was stunned 33-14 by Poway last week. The Barons had trouble running the ball, but QB Anthony Posada threw for 202 yards. San Marcos QB Bryson Bolin came out firing in a 37-13 win over Vista. Bolin completed 25 of 32 passes for 357 yards. WR Kyle Philips caught eight passes for 123 yards.